As summer temperatures lure us out into our yards, it's hard not to notice all those landscaping tasks we let languish all spring. When hiring a gardener is not in the budget, or when there is no gardening budget at all, here are some simple and inexpensive tasks garden experts recommend. only makes the garden look nicer but also serves a great purpose to keep weeds to a minimum and holds in moisture." Susan Palmquist, author of The Budget Smart Girl's Guide to the Universe, says use a new layer of mulch to spruce up your garden. "You can sometimes buy a 3 cubic foot bag for just $2," she says, "and it makes the garden look new again." Elizabeth Casulas of Southfield, MI, considers herself an avid gardener and recommends selling perennials when you thin them out. "I put an ad on Craig's List and sold them instead of putting them in the composter," she says. "I made $80, which I used to help fund this year's garden purchases and the people who bought my plants paid about one-fourth of the price they would have paid at the nursery. Everyone was happy!" Perennials: "Look around your neighborhood and see who has overcrowded peonies, huge clumps of irises, or some other perennial begging to be divided," she says. "Offer to dig it up and separate if you can have a couple of pieces." Annuals: "When frost threatens, snip off impatiens and simper florens begonias (the small ones you buy in flats)," she says. "Stick them in a vase or cup with water. A few weeks later, when they've developed roots, pot them up in good soil. Put them in a sunny winter (spot), trim if they get leggy, and in the spring, you'll have a good supply ready to plant." Seeds: "It's easy to collect seeds from marigolds, bachelor buttons, dianthus, and many other flowers," she says. "Put them in a enveloped labeled with the flower and color. Store in a cool cellar or even in the refrigerator. Start them early next spring, 6-8 weeks before the last frost in your area. (BONUS tip: Start seeds in flats or pots in a tray on top of the refrigerator. The gentle heat is good for germination. Be sure to cover the tray so the soil doesn't dry out.) "
Annette Pelliccio, CEO of The Happy Gardener, Inc., says make yourself free potting soil with kitchen scraps (no meat! ), grass clippings and yard waste. "You are doing something great for the environment and growing your own soil to save (money) on those 30 lb bags!," she says. "Plus, the compost is full of nutrients so you don't have to spend (money) on fertilizers for your flowers and veggies." Chris Cipriano, founder of Cipriano Landscape Design, says to save water, you should choose plants that require less and install rain barrels to collect rain water. Others mentioned you could even dodge the fancy rain barrels and simply slip a watering can under your downspout. Even if you don't have a green thumb, horticulturist Mike Sikes suggests you can re-use old pots, move shrubs in pots this year into the garden for next year and fill in with inexpensive filler plants from your local gardening center. Go digging: There are a lot of unique inexpensive items like pots and garden accents that can be found at thrift stores, estate and yard sales. Without getting too carried away with tacky lawn decorations, a few different colored pots or accents like a wooden ladder or garden bench can make a big difference in sprucing up your garden and making it your own. Think long term: Incorporate plants and flowers that come up year after year like perennials or roses. They may be a bit more of an initial investment but they will save a ton of money in the long run. Plant local: A good tip for being eco-friendly and saving money is to plant what is native to your area. These plants and flowers are often cheaper to buy and cheaper to maintain. Buy on sales: When purchasing your plants and flowers, look for sales. Garden stores always have sales so make sure to take advantage of these. The garden doesn't need to happen all at once. It can grow organically as you find the right items to add at the right price. 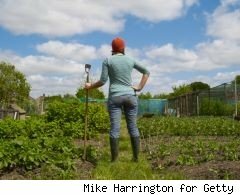 Start with seeds: Using seeds to start a garden is much cheaper than starting with plants that are already growing. You can barter with friends, neighbors and family; you bake them cookies, they give you seedlings or cuttings in exchange. Light it up: A beautiful garden should be seen in the day and at night. It's amazing the value that lights add to your home. Solar lights are an excellent option for keeping costs low. As they're powered by the sun, they are a one-time investment that will keep your energy bill low and truly add glam to your garden.